A memorial piece of a short life: US artist Cozmo Colon painted a portrait on the Rap artist XXXTentacion who died young in 2018. Elad Yehezkel from Israel did a great job by establishing a quiet and detailed artwork portraiting Amit, the dancer. 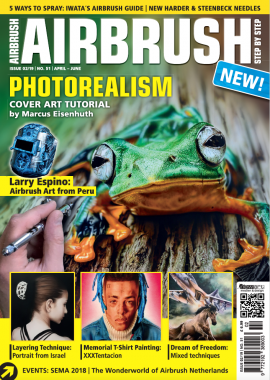 Marcus Eisenhuth from Germany calls his art „macro photorealism“ which causes surprise and astonishment wherever he goes. From the perspective of the young German artist Clarisse Pico, a mustang and a jet plane are symbols of freedom and progress. After designing his own custom guitar, Dalibor Pejicic from Croatia didn’t need to wait long for orders. He loves textures and patina effects. There are no suitable airbrush supplies available in his country. But, however, Larry Espino from Peru creates some awesome automotive painting.